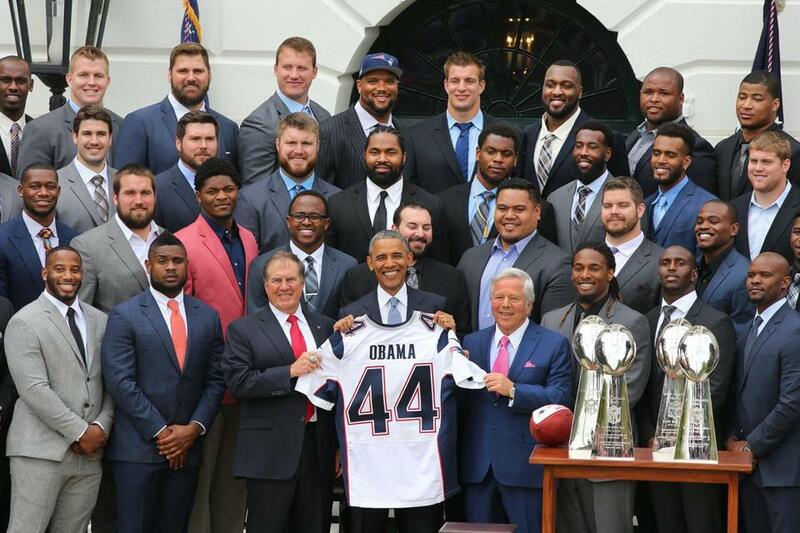 President Obama held up a Patriots jersey presented to him by the team. WASHINGTON — The 2014 Patriots — the majority of them, anyway — were together one final time Thursday, honored at the White House by President Barack Obama, with dozens of New England politicians in attendance to applaud their favorite team. As is his way, Obama peppered his comments with humor, though one of his early jokes wasn’t well-received by coach Bill Belichick or those Capitol Hill Patriots fans in the folding chairs on the South Lawn. “I usually tell a bunch of jokes at these events, but with the Patriots in town, I was worried that 11 out of 12 of them would fall flat,” Obama quipped, referencing the Deflategate saga. The remark drew some groans, and a thumbs-down from Belichick, whom Obama had turned to look at. Obama went on to praise the Patriots despite the scandal, which could have negatively impacted the team as it prepared for Super Bowl XLIX. Cornerback Darrelle Revis as well as running backs Stevan Ridley and Shane Vereen, who have signed with new teams, were all in attendance, as was still-unsigned free agent Dan Connolly. Vince Wilfork, now with the Texans, did not make the trip. Neither did Tom Brady, who the team said had a family commitment. Patriots president Jonathan Kraft also could not attend because he is recovering from recent surgery. But those who were there seemed to truly enjoy themselves. Throughout the afternoon, Twitter and Instagram filled up with pictures of players on the plane, posing in front of the busts of past presidents in the White House, and standing on the South Portico steps behind the president as he was talking. The sun came and went throughout the day, and Obama noted that it is usually warmer in Washington at this time of year, but after the winter New England endured, the cool day likely still felt balmy. He also noted Belichick’s attire; like everyone else, the coach was in a suit. He went on to say that he told Gronkowski he had to keep his shirt on. As is custom, Robert Kraft presented Obama with a personalized Patriots jersey, bearing the number 44 (he’s the 44th president); the president also was given a football and Patriots helmet signed by the team. Kraft said he appreciated Obama’s loyalty to the Bears in his adopted hometown of Chicago, but thinks the president should adopt an AFC team. “As leader of the free world, you are the ultimate Patriot,” Kraft said. After the ceremony, Kraft, Belichick, Gronkowski, Edelman, and Chandler Jones chatted with reporters about the day, which for some team members included a stop at the Walter Reed Medical Center to chat with wounded veterans. Gronkowski probably got himself into some hot water with an off-the-cuff remark he made when asked why he was well-behaved and didn’t dance during the ceremony. “You know, if they put some tunes on, I would have whipped out some dance moves, but Chandler wasn’t singing — he usually sings, Julian usually does the beat-boxing — but they were scared so there was no dancing today, baby,” Gronkowski said. He turned to look at Kraft and Belichick behind him, and things got uncomfortable for a moment, though Gronkowski was correct: It has been 89 days since the AFC Championship game and still nothing from the NFL on the results of Ted Wells’s investigation into what happened with the footballs that night. Belichick summed up the entire day: “It’s been an awesome experience . . . This is tremendous for our team, our organization, to go to the hospital, to be welcomed by President Obama so warmly, to have the opportunity for each of us to shake hands with him, talk to him.